The timetable is the frame for all aspects of school life, and a well designed timetable lays the foundation for a quality learning experience for students and for teachers. Designing a change to a timetable is a significant challenge, and not one that should be taken on hastily, alone or without significant, thoughtful reflection. The changes that we are developing come out of several years of conversation and experiment based on the Design Principles of The Learning Project. 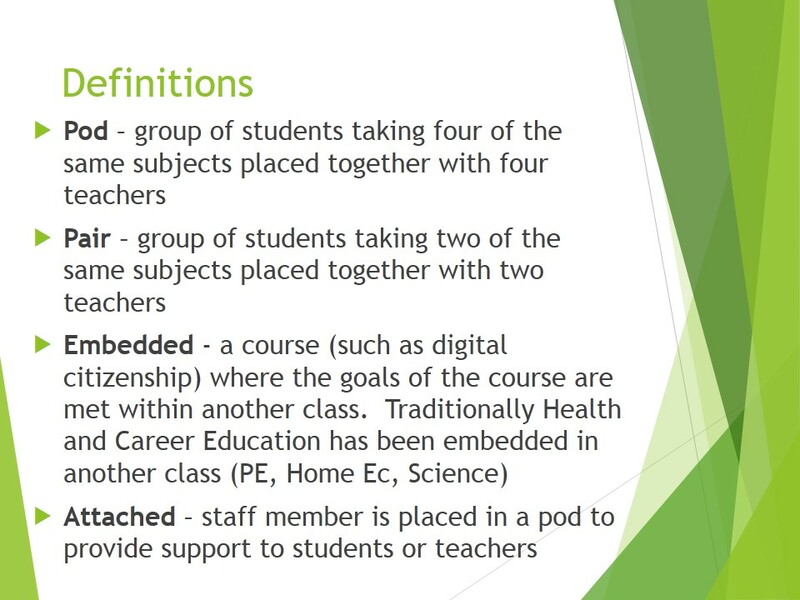 We are also facing change from the BC Ed Plan, which forms the core of our curriculum design. 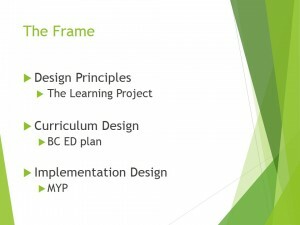 The day to day implementation of the principles of the Learning Project and the BC Ed plan will be guided by MYP. The timetable design would be impossible without the hard work of a group of about 20 teachers who got together every Tuesday afternoon for an hour and a half. The group started by developing a set of values that would guide our work together. These values formed the foundation of the rest of the discussions. The session that followed was a review of what is involved in the timetable decision making process, to make clear what the constraints are and where the opportunities lie. The remainder of the sessions were a series of discussions and debates on how to develop a Grade 9 timetable that embodied the values. The challenge that this group has really embraced is the challenge of looking at time and space differently. There are constraints that are created by length of the school day and space in the building (labs, gyms, specialized rooms, etc). Within those constraints, there is an enormous amount of flexibility, and the Grade 9 group began some amazing professional dialogue on the possibilities and opportunities that we have to design structures that better support student learning and deepen their learning experience. The one key change is that the timetable is linear for all grade 9 classes. After that, the rest is up to us. Some have said, “Why not just let it be linear, then, and not bother with the groupings?” It is critical to understand that the structure matters. We connect with the people that we see on a regular basis. When a group sees each other more often, the opportunity to build relationships and collaborative skill is present. When two teachers are working with the same group of students, there are opportunities that simply don’t exist in other arrangements. In a traditional structure, whether linear or semestered, the groupings of students change every block. This means that the students don’t have a consistent peer group that they see, and opportunities to build community are limited, because each group will be different from all the other groups a teacher sees in the course of a year. Colleagues don’t have the opportunity to build on what another does with their students, whether in terms of building relationships, specific learning skills, organizational skills, or skills for resilience and self regulation. The work of the Grade 9 timetable group was to design a timetable where these opportunities are present. This change has also raised a lot of questions. Below are some attempts to answer the questions that have come up so far. If you have additional questions, please email me and I will add them to the list. 1. Why is it so complex? – Timetables are complex, period. Even explaining a traditional timetable is complex. 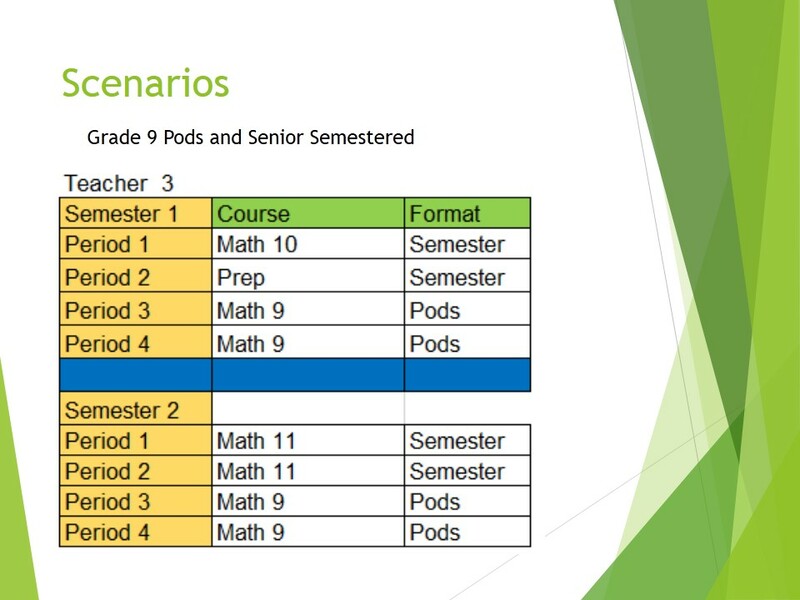 Our plan for the Grade 9 timetable is, at its heart, simply a linear timetable. The values that the Grade 9 timetable group developed are made visible in the student groupings (the Pods and Pairs). 2. Can I have a linear prep? – if you are teaching grade 9, we will do everything possible to provide you with a linear prep. 3. Will I end up teaching 4 or more different classes in a year? – as with any timetable, we always work to ensure that teachers are not teaching too many different classes. This will be no different. Further, if we want teachers to truly reflect on their practice, we need to reduce the number of preps so teachers can focus on making real change in their lesson design. 4. Why do we have a different daily schedule? – the daily schedule is still the same. Within that schedule, however, there are many opportunities to use time and space differently. The day schedule presented at the staff meeting was an example, not as a requirement, and would form a starting point for further professional dialogue. 5. How will students with special needs be supported? – we are currently planning for this. We will continue with our Inclusion model that will now be implemented in grade 8 and 9. Embedded classes and attached teachers are support staff who make it more possible for us to realize the aims of the Grade 9 program. 6. We are putting the things we learned from grade 8 into improving the grade 9 timetable. What about improving the grade 8 timetable? 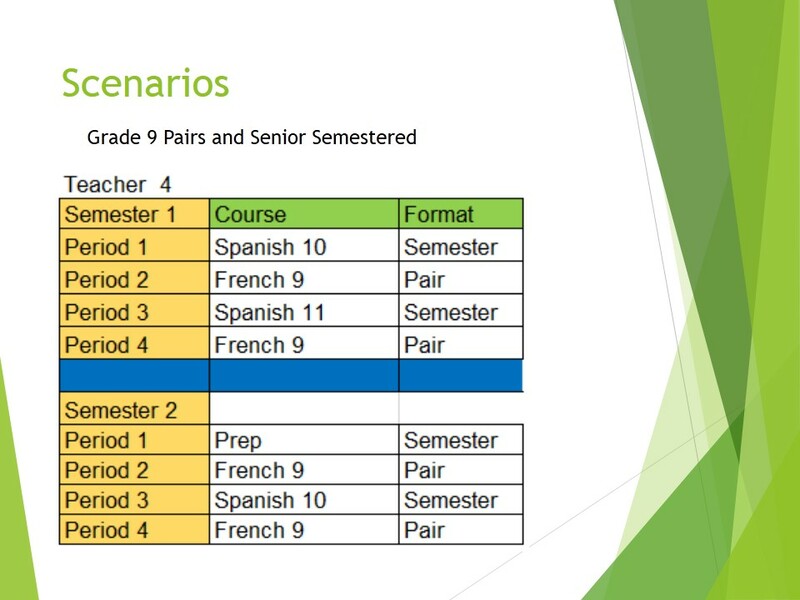 – next years Grade 8 timetable does include some of the things that we have learned. The timetable is a balance of priorities. 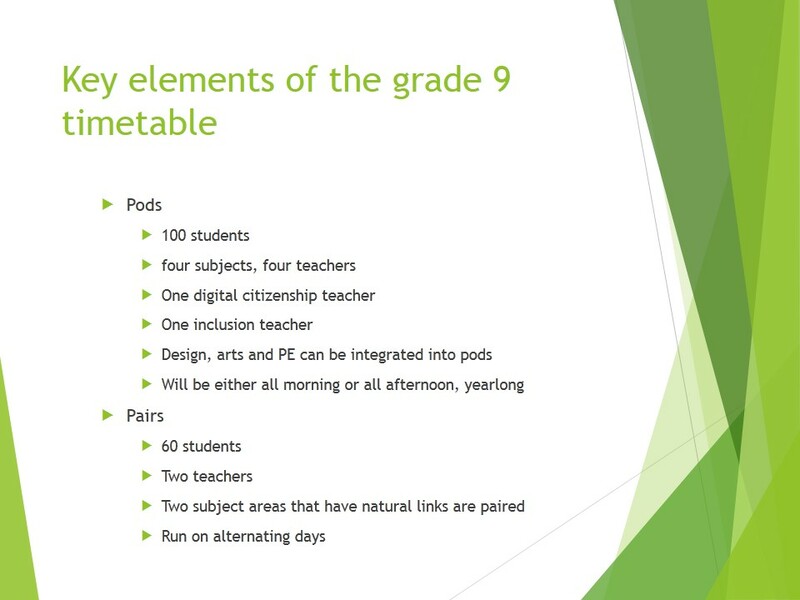 Having the Rotation structure (which provides students with the opportunity to see all aspects of the Arts and Design areas) means that the Grade 8 Pods only include traditional academic classes. 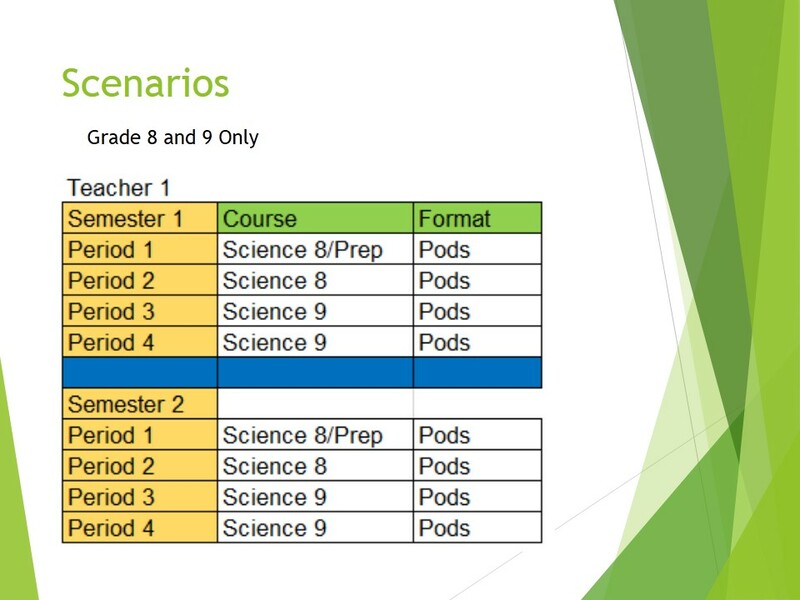 Below are images from the staff meeting presentation, with key elements of the timetable, including examples of possible teacher schedules.